Fluance has introduced the new DB12 subwoofer, which has a 12-inch, front-firing long-throw woofer and 240-watt (RMS) amplifier in a ported cabinet that measures 16.7 by 15 by 16.8 inches. The connection panel includes both line- and speaker-level inputs, and the subwoofer weighs 37 pounds. The DB12 is available now for $299. Fluance launches the new flagship product in its subwoofer line: the DB12. Utilizing only superior components and expert audio engineering, the DB12 Powered Subwoofer is designed and built with a passion for great audio and music at the center. The DB12 delivers powerful bass performance, which results in a truly immersive experience when listening to music or watching a film, perfectly replicating sounds from a mesmerizing bass guitar to a ground-shaking movie explosion. The DB12's extraordinary performance helps create home theater adventures with any setup. While most recordings contain bass frequencies that traditional speakers cannot easily reproduce, the DB12 is designed specifically to reproduce those ultra-low bass frequencies. Equipped with a 12" front firing long throw driver, the DB12 offers longer excursion and controlled linearity for a smoother, deeper bass performance, ensuring that the lowest frequencies on every track are heard consistently without any unexpected roll-off. The rigid cone design provides deep bass while maintaining minimal distortion. The DB12's high performance, low distortion amplifier provides a continuous 240 watts of clean, dynamic power (400w peak) to deliver heart-racing booms at the most intense musical and cinematic climaxes. Sporting an acoustically perfected and solidly constructed wood cabinet, the DB12 has been ported and precisely tuned to the enclosure and designed to reproduce both low and ultra-low frequencies. The solid cabinet construction uses engineered MDF wood for a warm and distortion-free sound. Fluance recommends that listeners combine two DB12s in a 5.2 or 7.2 system to create the ultimate, immersive home theater experience. The frequency output can be adjusted to blend speaker components and environment for optimal performance. 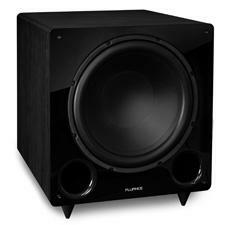 The DB12 Powered Subwoofer is available now for $299.99 at Fluance.com. • Visit the Fluance website for more product information. • Fluance HFF Floorstanding Speaker Reviewed at HomeTheaterReview.com.